Explore the picturesque Welsh resorts of Llandudno and Conwy on a fun and flexible hop-on, hop-off bus tour! Visit attractions like North Parade, West Shore Beach, Llandudno Museum, Conwy Castle and more! The Llandudno & Conwy Hop-On Hop-Off Tour introduces you to the attractions of two of the most scenic towns in the United Kingdom. With its unique combination of Victorian character and Edwardian elegance, Llandudno is considered to be Wales' premier holiday resort. Llandudno is the resort where the real Lewis Carroll's Alice in Wonderland spent her childhood summers. See the beautifully preserved seafront, hotels and shops in the arcaded shopping centres. Also worth visiting is Conwy with its scenic attractions and the stunning Conwy Castle. 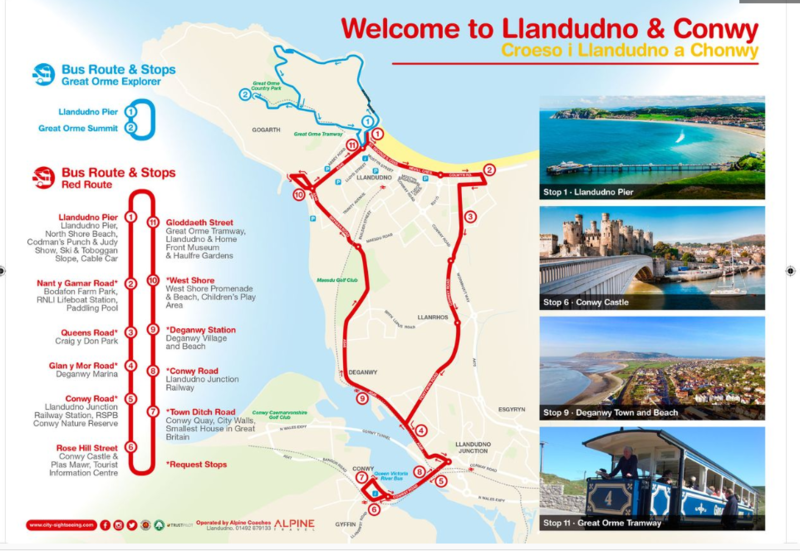 Hop on and off at any of the attractions and discover Llandudno and Conwy at your own pace! Buses operate between 10:00am and 4:00pm, every 60 minutes. Since this is an outdoor activity, schedules might just change sometimes check the frequency and bus operating hours on the day of your tour just to be safe. 1 loop takes 60 minutes. Duration: The ticket is valid for 24 hours after first use. Hop on the bus at any of the stops to start your Llandudno hop-on, hop-off tour. Valid for 24 hours, enjoy Llandudno and Conwy sightseeing on a fun and flexible hop-on, hop-off bus tour covering all the major attractions. A beautiful Victorian seaside resort, Llandudno boasts some of the most elegant seaside architectures in Britain. Bask in the picturesque beauty and Victorian charms of the splendid Welsh resorts of Llandudno & Conwy that lie between two gorgeous beaches and have much to offer. Visit North Parade, home to Llandudno Pier, a grade II listed building originally built in 1858, enjoy spectacular views of the Great Orme, the Pier, Conwy Castle and the surrounding countryside. With 1 route covering 11 stops around 2 towns, you can hop on and off at any of the stops to explore at your own pace. Enjoy audio commentary in English on the history, culture and highlights of Llandudno and Conwy and take in panoramic views of the beautiful towns from open top, double decker buses. Plans for wheelchair accessible bus available & in service. Great Orme Explorer (blue route) will be operational from 13 Apr 19 till 29 Sept 19, between 10:40am and 3:40pm.